The point graph is the most basic graph structure, it consists of a number of interconnected points in space called nodes or waypoints. The point graph takes a Transform object as "root", this Transform will be searched for child objects, every child object will be treated as a node. If recursive is enabled, it will also search the child objects of the children recursively. It will then check if any connections between the nodes can be made, first it will check if the distance between the nodes isn't too large (maxDistance) and then it will check if the axis aligned distance isn't too high. The axis aligned distance, named limits, is useful because usually an AI cannot climb very high, but linking nodes far away from each other, but on the same Y level should still be possible. limits and maxDistance are treated as being set to infinity if they are set to 0 (zero). Lastly it will check if there are any obstructions between the nodes using raycasting which can optionally be thick. One thing to think about when using raycasting is to either place the nodes a small distance above the ground in your scene or to make sure that the ground is not in the raycast mask to avoid the raycast from hitting the ground. Alternatively, a tag can be used to search for nodes. For larger graphs, it can take quite some time to scan the graph with the default settings. If you have the pro version you can enable 'optimizeForSparseGraph' which will in most cases reduce the calculation times drastically. Does not support linecast because of obvious reasons. Add a node to the graph at the specified position. Vector3 can be casted to Int3 using (Int3)myVector. Add a node with the specified type to the graph at the specified position. This must be a node created using T(AstarPath.active) right before the call to this method. The node parameter is only there because there is no new(AstarPath) constraint on generic type parameters. The node will be set to this position. Recalculates connections for all nodes in the graph. This is useful if you have created nodes manually using AddNode and then want to connect them in the same way as the point graph normally connects nodes. Returns if the connection between a and b is valid. Checks for obstructions using raycasts (if enabled) and checks for height differences. As a bonus, it outputs the distance between the nodes too if the connection is valid. 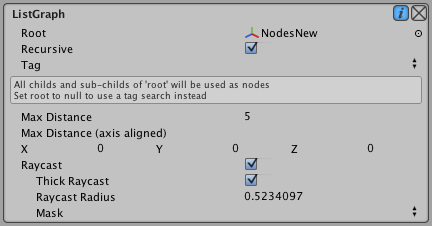 Rebuilds the lookup structure for nodes. This is used when optimizeForSparseGraph is enabled. You should call this method every time you move a node in the graph manually and you are using optimizeForSparseGraph, otherwise pathfinding might not work correctly. You may also call this after you have added many nodes using the AddNode method. When adding nodes using the AddNode method they will be added to the lookup structure. The lookup structure will rebalance itself when it gets too unbalanced however if you are sure you won't be adding any more nodes in the short term, you can make sure it is perfectly balanced and thus squeeze out the last bit of performance by calling this method. This can improve the performance of the GetNearest method slightly. The improvements are on the order of 10-20%. Max distance along the axis for a connection to be valid. Layer mask to use for raycast. Max distance for a connection to be valid. The value 0 (zero) will be read as infinity and thus all nodes not restricted by other constraints will be added as connections. A negative value will disable any neighbours to be added. It will completely stop the connection processing to be done, so it can save you processing power if you don't these connections. Number of nodes in this graph. Note that only the first nodeCount will be non-null. You can also use the GetNodes method to get all nodes. Optimizes the graph for sparse graphs. This can reduce calculation times for both scanning and for normal path requests by huge amounts. It reduces the number of node-node checks that need to be done during scan, and can also optimize getting the nearest node from the graph (such as when querying for a path). Try enabling and disabling this option, check the scan times logged when you scan the graph to see if your graph is suited for this optimization or if it makes it slower. The gain of using this optimization increases with larger graphs, the default scan algorithm is brute force and requires O(n^2) checks, this optimization along with a graph suited for it, requires only O(n) checks during scan (assuming the connection distance limits are reasonable). When you have this enabled, you will not be able to move nodes around using scripting unless you recalculate the lookup structure at the same time. If you enable this during runtime, you will need to call RebuildNodeLookup to make sure any existing nodes are added to the lookup structure. If the graph doesn't have any nodes yet or if you are going to scan the graph afterwards then you do not need to do this. Use raycasts to check connections. Recursively search for child nodes to the root. Childs of this transform are treated as nodes. If no root is set, all nodes with the tag is used as nodes. Use the 2D Physics API. Recursively adds childrens of a transform as nodes. Calculates connections for all nodes in the graph. This is an IEnumerable, you can iterate through it using e.g foreach to get progress information. Recursively counds children of a transform. Updates an area in the list graph.